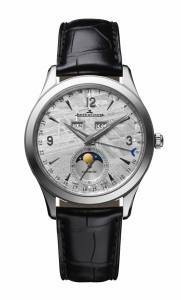 Jaeger-LeCoultre will present its SIHH novelties during the Doha Watch and Jewelry Fair in February. This year’s creations pay tribute to the astronomy. These novelties embody the magnetic beauty of the sky, moon and stars and incorporate materials directly related to Jaeger-LeCoultre’s astral inspiration, such as meteorite stone and lapis lazuli. By bringing them within reach of connoisseurs of fine objects, Jaeger-LeCoultre wanted the complete calendar and the moon phase to be showcased as watches which influence our daily lives. Calendar functions have long since been part of the watchmaking culture of the Grande Maison. Pocket-watches first appeared in the 15th century as miniaturised versions of table clocks. From the late 19th century onwards, the so-called Grande Complication models housed three major complications: the perpetual calendar, the chronograph and the minute repeater. Since then, inspired by the Earth’s movements and by calendar complications,Jaeger-LeCoultre watchmakers have provided interpretations of the perpetual calendar throughout its creations.